Just when you think Selfies can't get any stranger, a brand decides to go and take it to the next level. 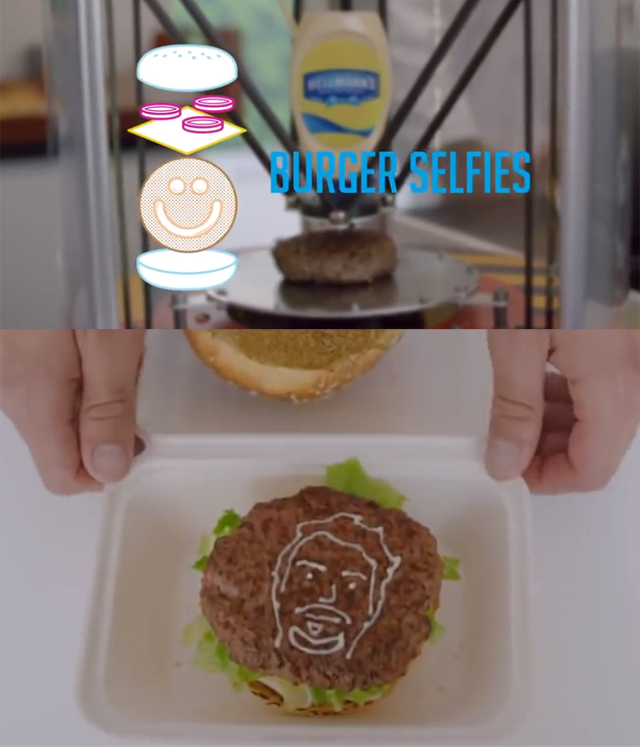 Hellman's Mayonnaise recently created a BBQ lab with a machine capable of putting your selfie, using mayonnaise, on your burger. No, this is no April Fools, and yes, I am very upset to have missed the opportunity to eat my own image in mayo on my favourite food... a burger. So how does it all work? Well, the man taking your order at the food truck snaps a pic on his iPhone. Said picture is uploaded to a computer which tells a robotic arm to create an image similar to what it has received... or something like that. What's the point in explaining here? Just watch this Burger Selfie moment brought to you by Hellman's Mayonnaise. Brilliant, just brilliant. What's next? Hot Dog full body selfies with ketchup?